We’d love your help. Let us know what’s wrong with this preview of Flying Fergus 2 by Chris Hoy. Fergus is a boy with a big imagination and a very special bike. He is also the first member of the Hercules Hopefuls cycling team, set up by Grandpa Herc to fight off their arch rivals, Wallace's Wheels. 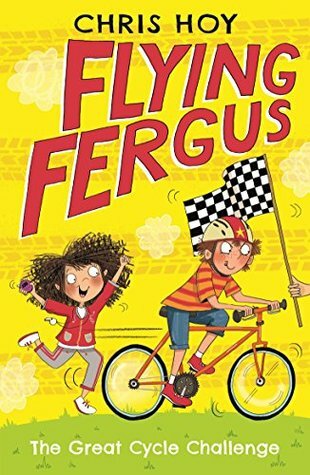 Fergus's friend Daisy would love to join the team too, but she doesn't have a bike - her The second in Sir Chris Hoy's fantastically fun, magical cycling adventure series. Fergus is a boy with a big imagination and a very special bike. He is also the first member of the Hercules Hopefuls cycling team, set up by Grandpa Herc to fight off their arch rivals, Wallace's Wheels. Fergus's friend Daisy would love to join the team too, but she doesn't have a bike - her mum thinks everything fun is dangerous. Maybe Grandpa Herc and Fergus can do up a bike from scratch for Daisy, with parts from Grandpa's junk shop? Now it is just Daisy's mum they need to persuade... Meanwhile Fergus takes a magical trip to Nevermore, where he and Princess Lily discover a magical compass bell once owned by Fergus's dad. Can the bell provide a clue to the whereabouts of Fergus's long-lost Dad? To ask other readers questions about Flying Fergus 2, please sign up. Sir Chris Hoy, a known former cyclist who became the first British Olympian claiming three gold medals at one games at the 2008 Summer Olympics in Beijing, decided to embark in writing. “The Great Cycle Challenge“ is a second book in series after the debut named “The Best Birthday Bike” in which reader had chance to meet this guy who wants so h Sir Chris Hoy, a known former cyclist who became the first British Olympian claiming three gold medals at one games at the 2008 Summer Olympics in Beijing, decided to embark in writing.